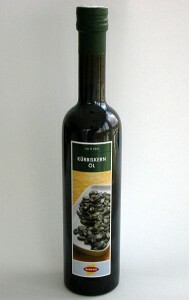 Pumpkin seed oil against hair loss (4 hairprotection points)	Noch nicht bewertet. Pumpkin seed oil has high amounts of antioxidants, carotenoids, omega-9 fatty acids, zinc, vitamin E, vitamin B1, B2 and B6. It is also rich in iron, potassium, calcium, magnesium, manganese, phosphorus, and selenium. Pumpkin seed oil contains just about 35 percent unsaturated oleic acid, linoleic acid, 55 percent and about 2 percent alpha-linolenic acid, an omega-3 fatty acid. In tests it was found that it is suitable to inhibit the enzyme 5-alpha-reductase. This means the formation of DHT is reduced, and affects hair growth positive. For internal use, we recommend taking a teaspoon after breakfast every morning. For external use after every hair wash a few drops of pumpkin seed oil should be applied to the affected areas of the scalp and the hair line and massaged. The oil remains in the hair so that it can be fully absorbed by the hair follicles. Who wants to strengthen the effect still makes bedtime a hot shower, which open up the pores of the scalp, then sprinkle some oil massaged for about two minutes into the scalp and let it work overnight.